AJ Styles made his pro-wrestling debut in 1998. During the early stages of his career, Styles was mostly competing on several independent wrestling promotions. His first big break was his stint with the World Championship Wrestling (WCW) in 2011. He then moved to TNA in which he stayed from 2002 to 2013. His tenure in TNA earned him immense popularity across the wrestling fraternity. He is a three time NWA World Heavyweight Champion and two time TNA World Heavyweight Champion. He completed the TNA Triple Crown five times and became the first ever pro-wrestler to do so. He is also a two time winner of TNA Grand Slam. Post TNA, Styles spent a brief period of time in ROH and after becoming the ROH Pure Champion, he moved to NJPW. He won the IWGP Heavyweight Championship in his debut match and went on to pick up the title one more time during his time there. He also took over the Bullet Club and began leading them. In January 2016, Styles signed with the WWE. Interestingly, this was not AJ Styles’ first introduction to the WWE Universe. He had also been approached by the WWE fourteen years ago, during the early days of his pro-wrestling career. Back in 2002, AJ Styles refused to sign with the WWE when he was offered to be a part of the development program. However, he was now about to be welcomed in the WWE as an established Superstar. Popularly known as the “Phenomenal One”, AJ Styles debuted on WWE as the eighteenth wrestler in the Royal Rumble 2016. Although he was eliminated by Kevin Owens, he entered the arena to a loud pop and was immediately established as the fan favourite. Soon, he picked a feud with Chris Jericho and both continued the rivalry on RAW and SmackDown. But he formed a tag team partnership with Jericho to introduce Y2AJ to the world. Together, they took on the The New Day. AJ Styles and Jericho once again entered into a feud and that ended in Styles’ defeat at WrestleMania 32. AJ Styles also became the number one contender to the WWE World Heavyweight Champion to challenge Reigns. Aftermultiple feuds, Styles was drafted to the SmackDown brand where he became the top Superstar. According to the storyline, Styles was fired after he ambushed SmackDown Commissioner, Shane McMahon. He initiated a rivalry against the Authority which resulted in one of the best segments in his WWE run. He defeated Shane O’Mac in WrestleMania 33 and ended that feud. Styles then initiated a rivalry with WWE Champion, Jinder Mahal. The two fought for quite long with most fans rooting for The Phenomenal One. Eventually, Styles defeated Mahal on SmackDown to win the WWE Championship and it was after thirteen years that a title had changed hand on a Tuesday night at SmackDown Live. Styles also fought Mahal at Clash of Champions 2017 and retained his title that he currently holds. He has been challenged by Shinsuke Nakamura for the title after the latter won the 2018 Royal Rumble. The two have shared history during their run in NJPW which makes their upcoming feud a dream match. 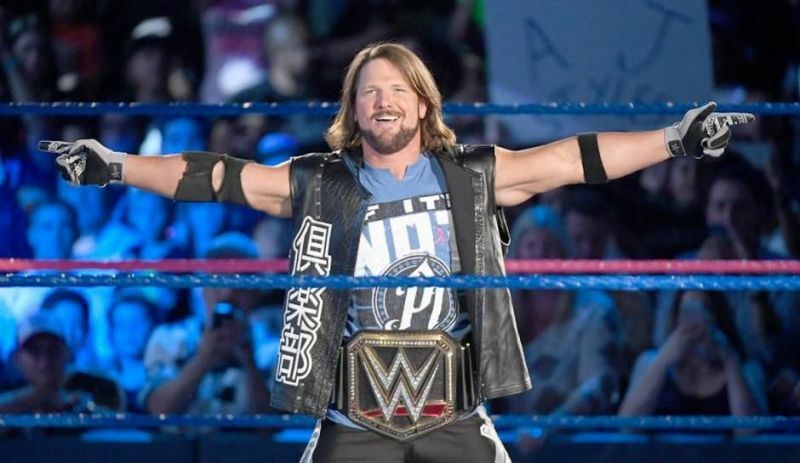 AJ Styles held the WWE Championship for 511 days. He dropped the title to Daniel Bryan on November 13, 2018 on SmackDown.